LOS ANGELES, Feb. 21, 2018 /PRNewswire/ -- Califia Farms®, known for its best-selling Almondmilks in distinctive, curvy bottles, today announces the launch of a breakthrough line of dairy-free Yogurt Drinks made with the Califia Culture Blend. This distinct trio of 10 billion live, active probiotic CFUs is powered by BB-12, the most documented bifidobacteria in the world and well known for its efficacy in digestive and immune health. Califia Farms is the first to batch ferment the BB-12 strain in a non-dairy yogurt. The cultures grow as part of the almond and coconut base, delivering probiotics as part of the whole food, versus being fortified and added at the end of fermentation. Beginning Spring 2018, Califia Farms will offer a new line of dairy-free, probiotic-powered yogurt drinks. The delicious, plant-based option will be available in multi-serve and single-serve portions and feature four flavors. Available in both multi-serve and single-serve, the Yogurt Drinks are available in four dairy-free varieties – Strawberry, Super Berry, Mango and Unsweetened Plain – which are all delicious, creamy, lower in sugar and flavored from real fruit. 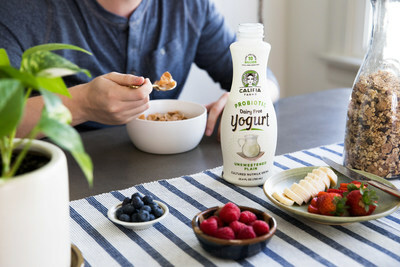 Through the launch of their Yogurt Drinks, Califia Farms is set to disrupt a new category and build upon the skyrocketing success that the brand has achieved with nut milks and coffee. "Increasingly, consumers are realizing the importance of probiotics because of their enormous digestive and immune health benefits," says Greg Steltenpohl, CEO, Califia Farms. "And until now, there hasn't been a non-dairy yogurt that delivers the delicious taste and creamy texture people want. At Califia, we've set the gold standard for nut milks and creamers, and were able to create an almond and coconut based Yogurt Drink that delivers 10 billion live, active probiotics that are truly great tasting." Since the brand entered store shelves, Califia Farms has disrupted and grown the nut-milk market with their high-quality, dairy-free milks. In 2016, Califia Farms accounted for 75% of the nut-milk category growth in the natural channel1. 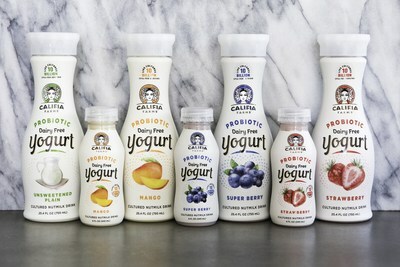 The company aims to continue this success through the launch of their Yogurt Drinks, which also mark Califia Farms' expansion into an all-new category. "I'm thrilled about this delicious, better nutrition option," says Ashley Koff, RD, CEO, The Better Nutrition Program. "Until now, consumers faced compromises in their yogurt and probiotic choices. The unique combination of this clinically-proven probiotic, cultured into a delicious dairy-free yogurt, delivers what I want people to choose more often." Califia Farms Strawberry Yogurt Drink – available in 8 oz. and 25.4 oz. Califia Farms Super Berry Yogurt Drink – available in 8 oz. and 25.4 oz. Califia Farms Mango Yogurt Drink – available in 8 oz. and 25.4 oz. Califia Farms Unsweetened Plain Yogurt Drink – available in 25.4 oz. The Yogurt Drinks are an easy dairy-free swap for an existing meal or snack, and can be consumed by themselves, mixed with granola, added to a smoothie, and more. Ideal for adults and kids alike, these probiotic dairy-free Yogurt Drinks can promote a healthy digestive system which can lead to a strong immune system. The suggested retail price is $2.69 for the single-serve 8 oz. bottle and $5.49 for the multi-serve 25.4 oz. bottle. The yogurts are non-GMO, dairy-free gluten free, vegan, kosher and free of carrageenan. 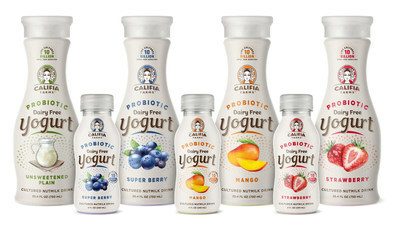 The Yogurt Drinks will be available to sample at Natural Products Expo West, booth #4978 and #4979. Inspired by Queen Califia, the mythical namesake of the state of California, Los Angeles-based Califia Farms was founded in 2010 and has become of the fastest-growing natural beverage companies in the U.S. Renowned for having the best-tasting plant-based beverages on the market artfully packaged in a disruptive curvy bottle, Califia has become the number one refrigerated nut milk and refrigerated RTD coffee brand in the Natural and Specialty channels by creating innovative, healthy and great-tasting premium beverages that make it easy for consumers to go 'plant-powered' and live dairy-free, without compromise. Califia is on a mission to discover and share 'what plants can do' to help achieve whole body health and to encourage wider adoption of plant-based foods and beverages for the good of our planet. Join the conversation with @CalifiaFarms on Facebook, Twitter, Instagram and Snapchat.